Car dealerships are famously depicted in movies and televisions as places where men in cheap suits sell faulty machines to gullible people, but the reality of car dealerships is much more pleasant. If you were to go to a Cars and Co Audi Dealer, for instance, you’d find a car yard full of pristine cars with car salesmen who are keen to help you find the car that suits your needs and your budget. The only thing a car salesman would gain by selling a faulty vehicle is an enemy and a bad reputation, so the more helpful they can be, the better for everyone. It’s not always clear, however, what the best way is to point out what you need to these salespeople, so we’ve put together a list of a few things to keep in mind when navigating the sales tactics of a car dealership. Choosing a price point is your first goal for the search for a new car, before you even decide what kind you want to look for. Setting yourself an ideal amount and an amount you can stretch to for a good deal is a great idea, because it means you’re ready in case of any outcome. Say you go to the dealership and find a car that seems perfect but the price is too high, you know then if the price is higher than your stretch price, you may be making a rash decision in the spur of the moment. Take time to step back and re-assess the situation, a rushed decision is rarely a good one. Once you have your price point, you can begin researching cars and relevant prices. Finding the right car can be tedious, but it’s more often than not a pretty simple process. Most websites that sell cars have a “search by price” feature which you can use. This will also give you an idea of what makes of cars you can afford, and in what condition. Keep in mind though, that just because you can afford an expensive car, like a BMW, doesn’t mean you should buy one. The more expensive the car is brand new, the worse off the car in your price bracket tends to be, provided you’re buying second hand. Choosing extras is a step taken when buying new cars, and involves things like leather seats instead of fabric, or a larger, more powerful engine. These things are great additions to the car you’ve decided on, and can change the driving experience entirely in some instances, such as ABS or Sun Roofs in some models of car. These don’t make the car any more or less driveable, so it’s important to take their cost into consideration before settling on them. 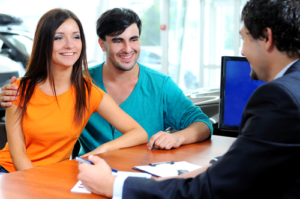 Test driving your potential car is a very, very important step in the purchasing process. It gives you a feel for the car, for the way it drives, for it’s power and handling, and it’s one of the best ways to figure out if this really is the car for you. Finally, with all of the above done, you’re ready to sign for your new car and pay up. Depending on what they have in stock, you may end up waiting several weeks for your actual car to show up, but that’s because most dealerships don’t stock every variation of every car at that particular dealership. If you’re buying second hand, you’ll probably drive away the car that you test drove. Buying cars can be fun when you know what to look out for, so keep your eyes peeled for a good deal at a trustworthy dealer.